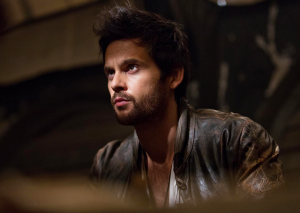 Da Vinci’s Demons star Tom Riley has spoken to Flicks And The City about his upcoming role on Doctor Who, and on the impact 12th Doctor Peter Capaldi will have on the show. Riley wouldn’t, however, confirm rumours about which character he’ll be playing, though many fans think he might be playing the mythical Robin Hood, based on set photos that recently leaked. Oscar-winner Peter Capaldi made his first appearance as the Doctor in the 50th anniversary special The Day of the Doctor – which won an award on the night for Best Visual Effects – before Matt Smith regenerated into him in the Christmas episode The Time of the Doctor. Doctor Who season 8 is rumoured to be airing in the UK in July, though no official date has been announced. Da Vinci’s Demons is currently airing its second season Fridays at 10pm on Fox. Camera on the above Tom Riley video by Emilie Rosson. Wondering what Doctor Who cast & fans including Billie Piper, Paul McGann, and Colin Baker think about Peter Capaldi as the new Doctor? Then check out our video below! One comment for "Doctor Who, Peter Capaldi, & Da Vinci’s Demons Interview with Tom Riley"